Users of our apps for iPhone will now see a newer, more modern layout. Instead of the grid of square icons on the home screen, with each icon taking the user into a different section of the app, users will now see guide content on the home screen. 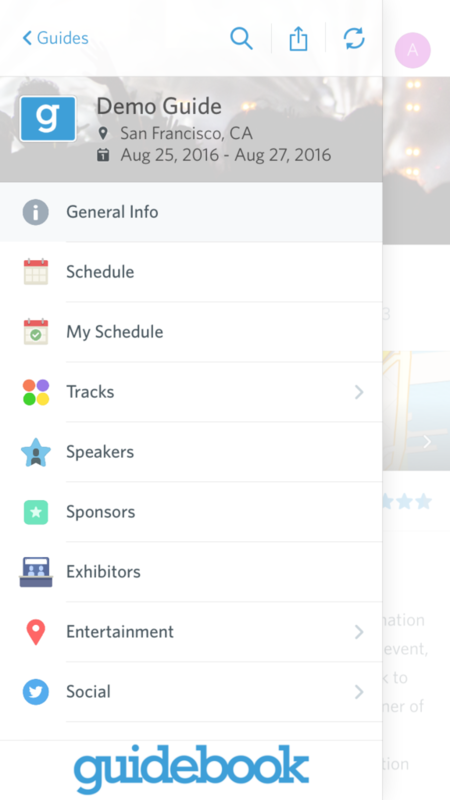 A “hamburger menu” in the upper right corner of the screen will slide out and provide access to the app’s different sections (schedule, maps, social media, etc.). In the past, users were most familiar with the navigation on the home screen of an iPhone or iPad, so we wanted to mirror that design in our apps so that there wouldn’t be a steep learning curve. This is why we went with a grid of square icons as our preferred navigation. But times have changed, and many of the most innovative and popular iOS apps including Uber, Google Maps, and Facebook now offer navigation through a slide out menu. This means that users are more familiar with that style of navigation, and it will be easier to use. It also allows you to get from section to section with fewer clicks. The other nice benefit of the change is that the navigation is now consistent across iOS, Android, and the web. Now it’ll be easier than ever for users to assist each other regardless of device.